The Songbirds: Ladies Singing Group - Aspire Arts Academy - "Aspire to be YOUR best"
Aspire Arts Academy - "Aspire to be YOUR best"
This friendly, encouraging and social group has a broad repertoire of songs sung in two, three and four part harmony from classics to beautiful ballads and arrangements from films and shows. It’s an excellent opportunity to make friends, make music and have a lot of fun. The group is truly open to all, there are no auditions and the ability to read music is not a requirement. 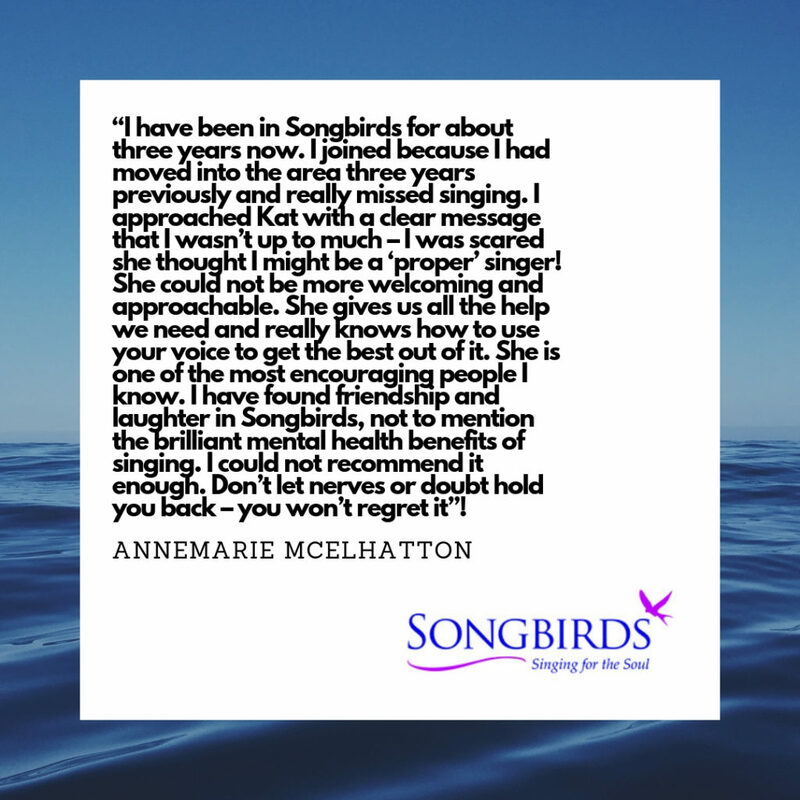 What is needed is a love of singing and a willingness to ‘give it a try’. 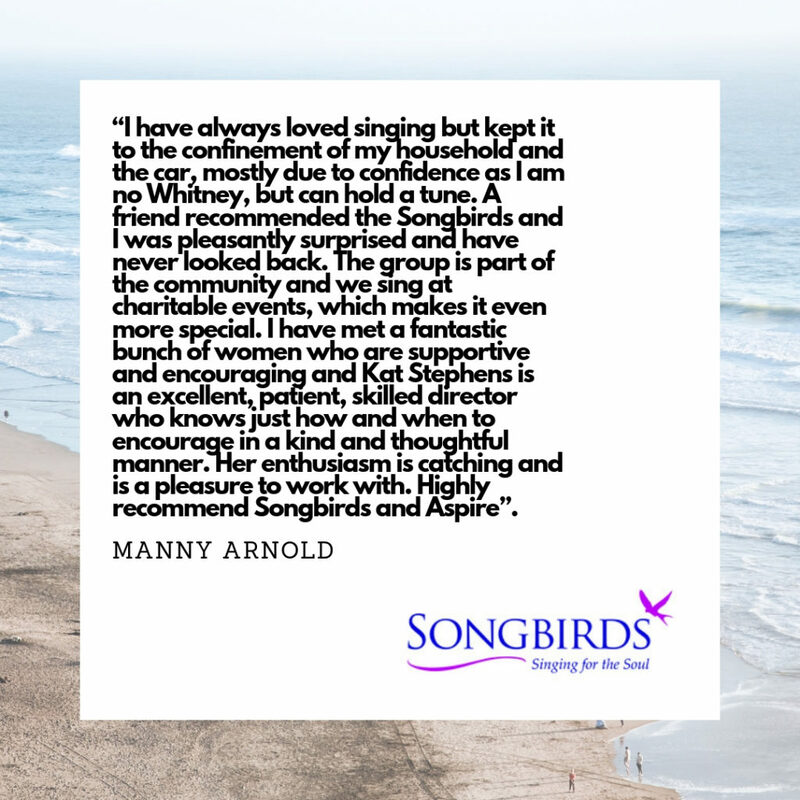 The Songbirds enjoy performing at both private and public events and regularly support community groups and charities. 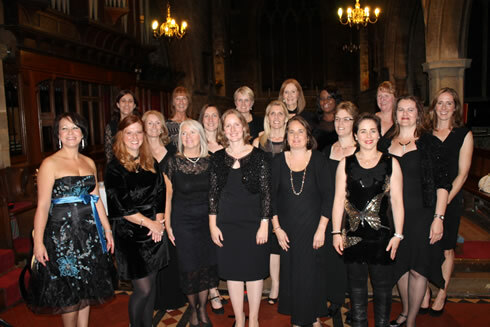 Amongst others, performances have included a ruby wedding anniversary party, Towcester Midsummer Music, Carols for the Alzheimers society, Christmas at Stowe and a Ladies night for the Rotary Club. 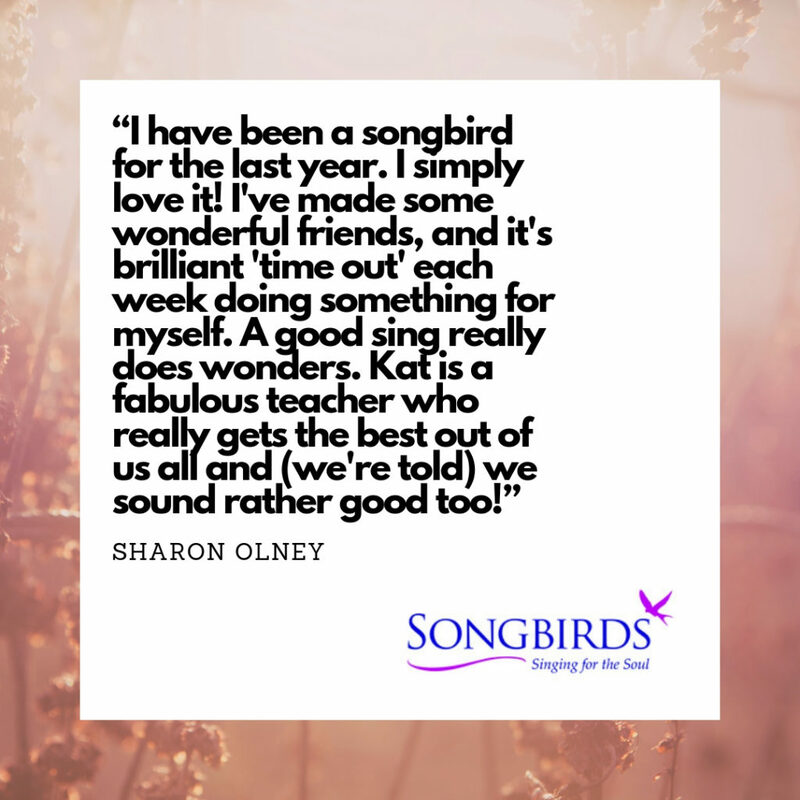 The Songbirds meet on Monday evenings during term time from 7.45-9.15pm at Nicholas Hawksmoor Primary School in Towcester. “Bravo! What a performance you and the girls gave us all on Friday night. I received so many compliments from the guests regarding the singing talent. I hope you are proud of yourself and your girls – you should be! Please could you pass on Caryl’s thanks to all of The Songbirds? She was delighted with the way her evening went. 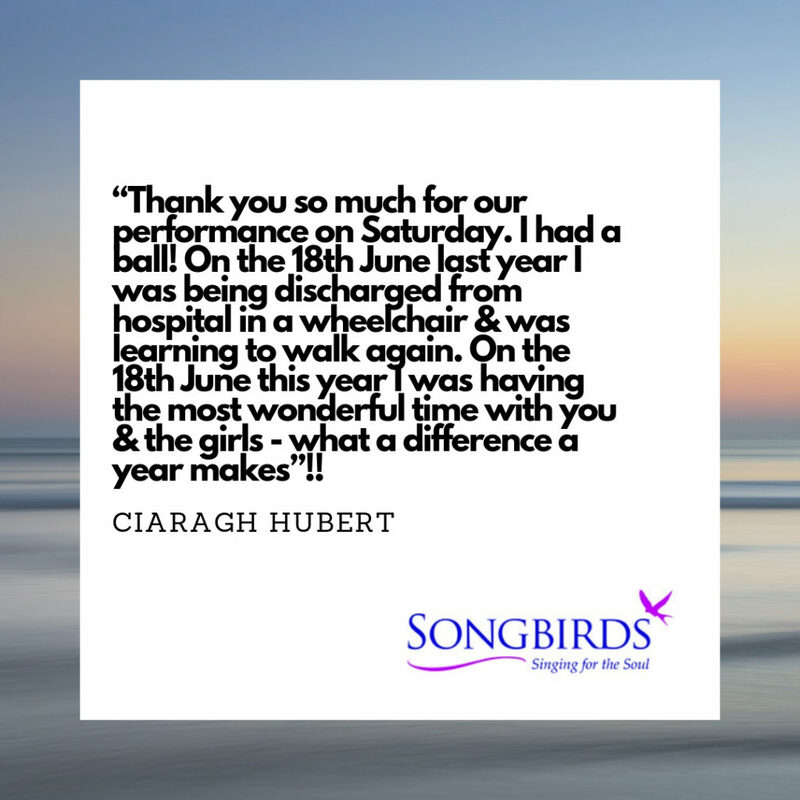 To quote one of the guests: “What a truly successful evening on Friday – the red, white and blue, the wonderful music, beautiful singing and the amazingly resounding crescendo Proms singing as a finale.” Praise like this would not have been possible without you and The Songbirds, so thank you”.